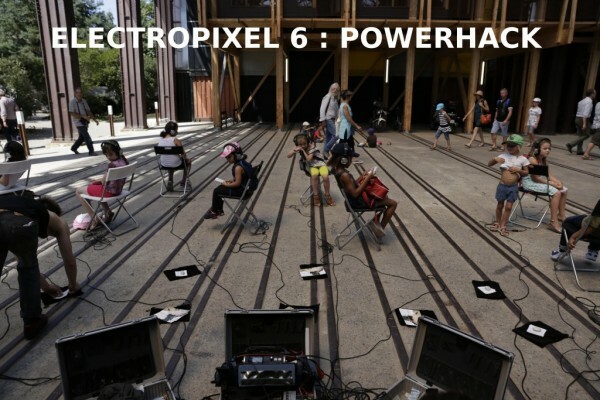 Electropixel#6 is a festival dedicated to emergent digital and electronic art forms that experiment with public spaces. This year the theme will focus on Powerhacking, in its broadest sense : in terms of power (Faculty, Capacity, Physical ability or Permission to do something), in terms of energy through the act of diversion and transformation: hacking. Electropixel # 6 will disrupt the classic place for diffusion, allowing the exchange of electronic fluctuations, sound and poetry through numerous concerts, performances, discussions, unusual experiences and urban action from derives to situations… The festival will also create a movement in through various neighbourhoods and locations, beyond the Fabrique and towards the outskirts of Nantes. Reiterating forms such as TAZ (Temporary Autonomous Zone) with screening areas and multiple incongruous and unexpected encounters. Powerhack – transformating power, open our energy practices, diy, open democracy, diwo, post-digital, diversion urban practices, architecture, exchange, community, auto-organisation, performance, transformers, solar, natural forces, renewables, ecology, ph, earth, electricity, alchemy, plants, nature, code, preservation, power to the people, power to the planet. Money : 150€ + housing + food.